I had an opportunity to use this assignment (in LIBR508) to address my concerns which were on the difficulty that I had in engaging with some academic writings for the courses at SLAIS. My contention was that visual aids could help bridge the gap and serve to keep readers engaged and interested. The idea behind the exercise was to develop critical thinking skills in providing sufficient evidence backing the student's case for the views/argument. The method of presentation was to be based on the topic chosen and freedom of expression was given and encouraged. This exercise was developed from a proposal stage wherein feedback was provided by the instructor. The feedback was taken into consideration and then a draft was prepared which was peer-reviewed and further revisions were made. I highlighted the issue that I had which was difficulty in engaging with some academic readings recommended for core courses at SLAIS. My contention was that the disconnect was due to the particular writing style/delivery method used by the authors concerned. My intention was to bring in a change of information practices especially in the academic writings through the use of visual tools by authors concerned. The topic of my brief was Impact, engagement, and assimilation: a case for visual tools in academic writings used at SLAIS. 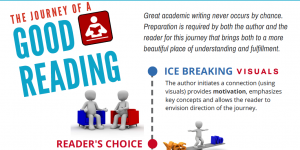 The following infographic was created (using Canva infographic maker) to highlight the issue and bring some solutions to academic authors who are addressing issues that for the topics for readings at SLAIS. This was included in my final project brief after due introduction to the issue and just before the inclusion of the list of references. This activity was beneficial in many ways as I had the opportunity to try out infographics for the first time using the Canva infographic maker. I had the chance to try out the production of a 2-minute video for the briefing pitch using Camtasia as a video producing and editing tool. Besides these skills, I believe that I have added to and refined my critical thinking skills which help me to see the two sides to each story thereby bringing balance and perspective to all aspects whether it be academic writing or common everyday occurrences in our daily routine.